A functional desk makes for a productive day, right? We have been in our new home for about a month and I just now got my desk items unpacked and sort of situated. It is amazing how much more productive and motivated I feel now that I am up off the futon and away from the TV while working on my laptop. There is just something about “wife swap” on lifetime tv that keeps me from being productive and motivated in my writing endeavors. Oh and that show makes me feel like I am a useless bump on a log for not cleaning my house for 5 hours every day. I have no children to chase after so it makes being a stay at home gal feel ridiculous too. Anyway, now that I am out of the living room and at my desk I feel all professional and motivated again. Oh I sold another article to an online publisher thanks to a publisher I am already writing for (if you want me to send you an invite so you can write for them too email me). I am also in the process of getting a guest author thing set up with another online publisher so my writing is really keeping me busy. Sure it seems like being able to spend 5 days out of the week at home in your PJ’s or bathrobe is great but in all actuality it just makes you feel like a hobo or a shut-in. Sure I shower every day and wash my clothes but not actually getting dressed and put together for the day takes it toll, trust me. Tonight N and I are going be strange and visit the local super walmart after he gets off work at 11pm. Back in the day doing our grocery shopping in the middle of the night was the norm. I worked 3rd shift and he worked the 2nd shift so that was the crazy schedule we were on. The stores were quite too! After last weekends shopping hell we vowed to try shopping when less people were in the stores, that means midnight super walmart shopping tonight! We’ll let you know how it goes. Anywho, I have gotten way off topic here! What I was actually trying to get at in this post was my desire to see YOUR desk set up. 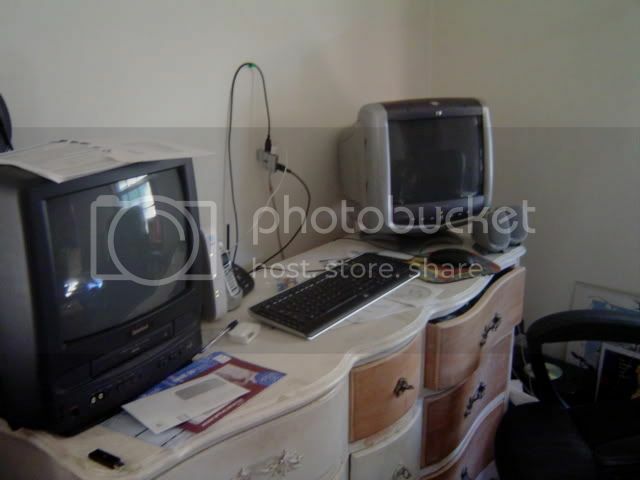 Yes I do want you to post a photo of your desk in action. Now don’t go straightening it all up, I want to see it in all it’s functioning glory! If you are brave enough to participate just post an un-staged (no cleaning or straightening first!) 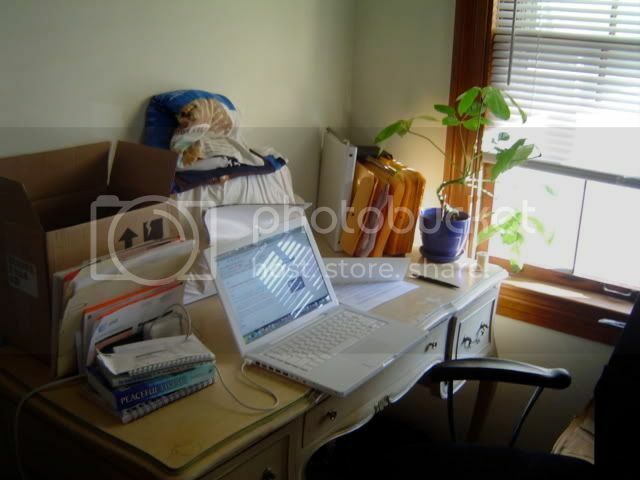 photo of your desk on your own blog (you can link back here if you want to). Then leave me a comment below with the link to your post so I can check out your desk. Your work space says so much about you and I am just too freaking nosy curious! See my sewing machine and the unfinished T-shirt quilt behind my MacBook? I sew and write and love plants! It is a dresser actually because we gave his desk away to save on moving costs. We are going to buy a new one someday, just haven’t done it yet. P.S. I wanted to give some linky love to Donna B for her snort worthy caption she left for my Wordless Wednesday October 1st post. Thanks Donna you totally made me laugh! Without the encouragement of box wine, I’d have never taken this photo, much less uploaded it. Note the “Dummies” book on the shelf. You’d think I’d have least removed that!